UPDATED: Crown Princess Mette-Marit’s eldest son, Marius Borg Høiby, has been eagerly releasing private photos of family holidays and other information about the royal family’s whereabouts for months, reported newspaper VG on Wednesday. No one seemed to realize that the use of such popular social media could harm the family’s security. 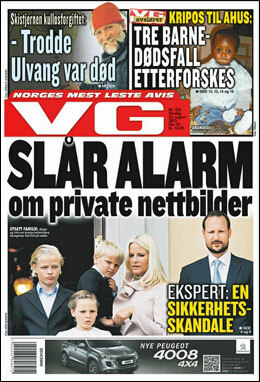 The now-15-year-old son of Mette-Marit and an earlier partner has no royal title himself, since he was born before his then-single mother married Crown Prince Haakon. He’s in practice, though, a full member of the family and elder half-brother to Mette-Marit’s and Haakon’s children and royal heirs, Princess Ingrid Alexandra and Prince Sverre Magnus. He’s also a natural part of family holidays and special events, and apparently has enjoyed sharing his experiences via social media. Petter Gottschalk, a professor at the business school Handelshøyskolen BI, said he was shocked to hear about Høiby’s open Instagram profile, and what he’s been publicly sharing over the Internet. Shortly after VG journalists made officials at the Royal Palace in Oslo aware of Høiby’s open Instagram profile, it was locked and made private, so it no longer can be opened by others than his own personal contacts. In addition to the photos he shared, Høiby had released information on where he and his parents were at any given time and where they planned to travel for work and holiday. Helge Lurås, another terror expert who leads the Center for International and Strategic Analysis (SISA) in Norway, also said details around travel and movements should be limited to lower the threat of kidnapping or other forms of terrorist attacks against individuals. No one considered a potential target should reveal their whereabouts via social media or over the Internet, he said. VG journalists went through the 133 photos in Høiby’s profile that are no longer available for public view, and reported that they included images of Høiby in the crown couple’s car on his way to High Camp at Turtagrø and at the place where he’s been working. There were also photos taken from the balcony of the Royal Palace on the 17th of May, of himself and his family before they went to southern Europe on holiday, and a picture of himself with pop star Rihanna, likely taken in connection with her appearance at a concert in Oslo in June. Asked whether he thinks PST and police attached to the royals were aware of the public Instagram profile, he said they should have been. A PST spokesman said he couldn’t “go into detail” about what advice PST had given the royals regarding their use of social media. Crown Princess Mette-Marit is herself an active user of Twitter and Facebook. He said that PST in general has advised high-profile persons to be conscious of what they’re putting out on social media. “It’s also one thing for PST to give advice,” spokeman Martin Bernsen told VG. “It’s another thing whether the person who receives such advice actually follows it.” A palace spokeswoman declined comment on the issue, which comes during a period of great public debate over security or the lack thereof in Norway following last year’s terrorist attacks. UPDATE: Marius Borg Høiby went through the traditional confirmation ceremony at Asker Church on Sunday September 2, with King Harald and Queen Sonja present along with most of the rest of the family. Newspaper Aftenposten reported there was no tweeting by royal family members from the confirmation party at the crown couple’s nearby residence after the church ceremony.